For that, and to make shiny new weapons and more, you need crafting stations. All of these can be found in the Production tab of Architect and are best in a dedicated crafting room, next to your stores. Some tasks you’ll want to do as soon as you have the materials. Others are best monitored so you don’t use up resources. Let’s say you want to make a jacket. Build a tailor’s bench (preferably powered) and you’ll find it works much like a butcher’s table or stove. Everything you can make is listed in the Bills section. If you add a duster, you can take a look at its details to see what materials you need. Here you can choose particular materials or set a minimum skill for the person making it, if you want to make sure of its quality. It takes some time to work out which benches are used for which item, or even which items are best for certain jobs, but you can easily tell when you need new items. 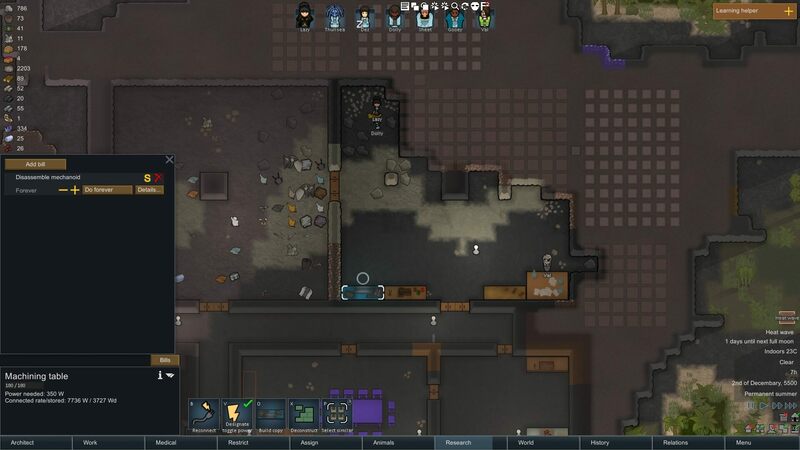 If your colonists have torn clothing — or none at all — a notification appears on the right side of the screen and won’t go away until you fix it. If hunters don’t have weapons, RimWorld tells you. One thing it is useful to do is assign clothing policies to your colonists. In the Assign tab, you should see that all your colonists are allowed to wear anything. If you click on Manage Policies, you can edit this ‘Anything’ policy to be more specific. Move the lowest slider to 50% to make them take off anything so tattered they’d complain. You can sell this tattered apparel to traders or burn it later. Note that if you have clothing mods, some items may be forbidden in this policy by default, so you may want to check that. 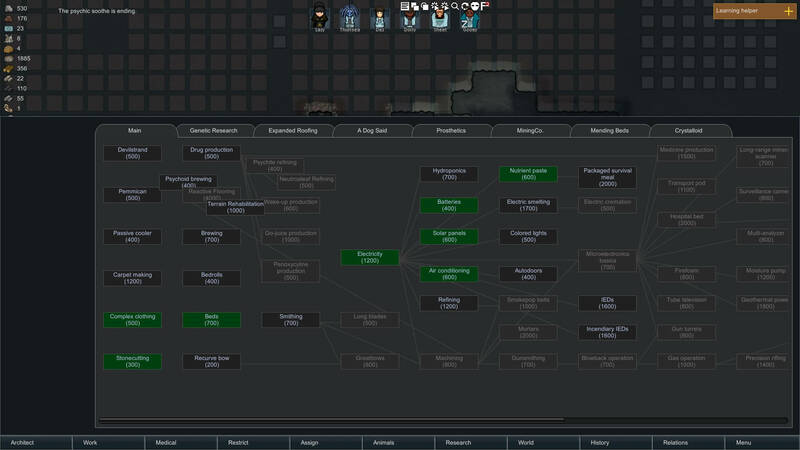 The more mods you have, the more tangled your research tree, but it’s easy to see prerequisites and unlocks. If you want to give all your colonists assault rifles and power armour, bad news: you don’t know how to make those yet. This is why building a research bench is one of the best things you can do early on. Research benches are a bit different to normal work stations. Work doesn’t happen in bills, but rather continuously. That means if your researcher has research prioritised above all else and you have an active research project, they’ll never do anything else. Prioritise everything you actually want them to do higher, then it should be okay. You can choose an active research project from the Research tab along the bottom of the screen. There’s an awful lot to choose from, especially if you have mods, so make sure to read the description of each research project available to you before choosing one to work on.